Looking for a way to help others while you read this summer? The following information taken from the World Education’s website can get you started. 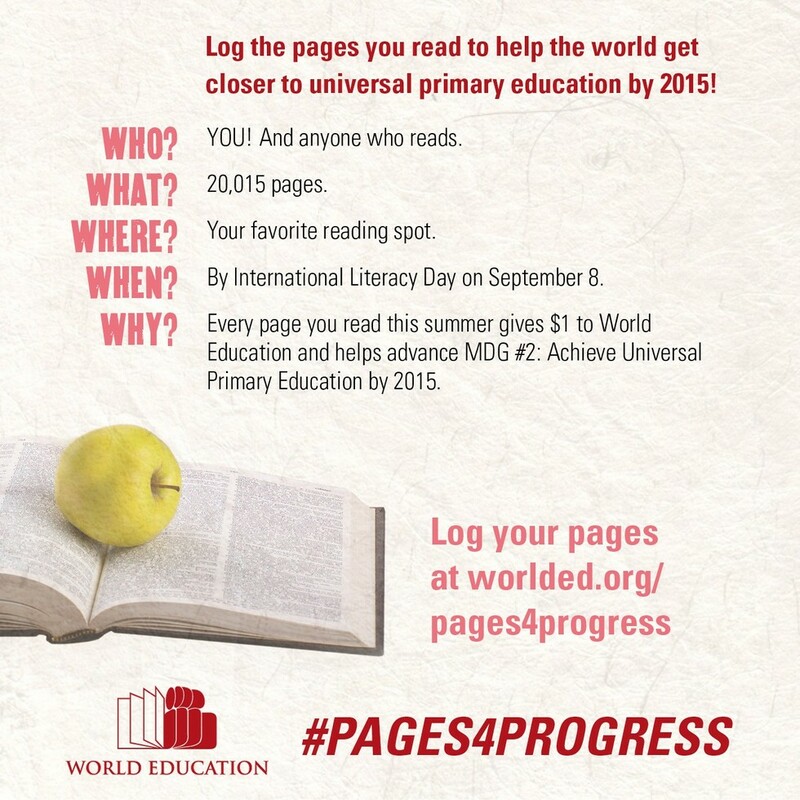 World Education’s #Pages4Progress campaign is asking readers around the world to read 20,015 total pages (in recognition of the 2015 deadline for the UN’s Millenium Development Goal #2 to reach universal primary education) in time for September 8th, 2014—International Literacy Day! By joining the #Pages4Progress campaign, you’re letting the world know that literacy and basic education are a huge priority and raising funds to help make universal primary education a reality. Every page you read = $1 to World Education’s literacy and education programs! Do you remember the television program, Reading Rainbow? The host, LeVar Burton, has a campaign going to raise $5 million to bring Reading Rainbow as an app, and full on-line version to homes and underfunded classrooms across the country. In less than 24-hours $1 million was raised. The campaign is on it’s way to reaching the $5 million mark. The snippets of information below are from LeVar’s website for the project. Go to the site to read the full article. Bring Reading Rainbow to more platforms, and provide it to more classrooms that need it for FREE. Our NEW GOAL: $5,000,000! And: numerous studies reveal that children who can’t read at grade level by the 4th grade are 400% more likely to drop out of high school. These problems won’t solve themselves. Real change will require us all to work together. We cannot afford to lose generations of children to illiteracy. And if we work together, we don’t have to. Second, a resounding number of teachers have told me that they want Reading Rainbow in their classrooms, where they know it can make a difference. We will provide it, along with the tools that teachers need, including teacher guides, leveling, and dashboards. And with your help, we’ll provide it to thousands of disadvantaged classrooms for FREE. For those of you who have put an animal to sleep, you understand what an incredibly difficult, painful thing it is to do. You understand the tears. The sorrow. The hurt. The love. Kirby was a real sweetheart. She faithfully watched Pilot drive off to work every morning, and was the first to greet him when he returned in the evening. She was our protector. She guarded us day and night. She knew friend from foe. Her death came at the hands of a quickly spreading, incurable, cancer. Her last days reduced Kirby to needing to be hand-fed by Pilot. Even in her pain, the cancer couldn’t keep her tail from wagging when she saw us approach. Instead of remembering the cancer, I choose to remember how Kirby captured my heart the first time I saw her at the pet adoption. We weren’t even looking to add another dog to the two we already had, but once I picked Kirby up, I refused to put her down until we walked out the store with her. I choose to remember how Kirby strode into the house that very first day and established the fact she was alpha to her two unsuspecting brothers. I choose to remember how smart Kirby was. How she herded us to bed every night at precisely the exact time. No matter the seasonal time changes. I choose to remember how her soft fur shone in the sunlight. How she looked when she found a mud puddle. And how she barely tolerated the introduction of a new puppy, Bear, into the family two years ago. Kirby was a wonderful companion. We were privileged to share our home with her all these years. Although we wish there had been more good days for her, we are thankful for the almost 13 years we did have.